Description: In order to use EQuIS Google Earth Reports for commercial purposes, you must obtain the appropriate license from Google Earth. The purpose of this report is to show locations from an EQuIS facility in Google Earth. Each location is labeled with the DT_LOCATION.SYS_LOC_CODE. The Places tree in Google Earth groups each location by type (i.e. DT_LOCATION.LOC_TYPE). The report output can also include DT_LOCATION.LOC_DESC in the 'callout box' when a location is clicked. Another useful feature of this report is the ability to display documents and photos for each location. Associate documents or photos with a location using the Explorer Widget in EQuIS Enterprise. When uploading a document or photo, select the desired location from the drop-down. The Google Earth Locations Report will create a balloon pop-up for each location listing the documents and displaying any photos. The ability to add documents or local non-image files is no longer allowed as of Google Earth 5.0+ without modifying Google Earth settings. This is due to imposed security restrictions by Google. Please see the information below for further instructions. 1.From the Explorer Widget (in Enterprise), select "New File" and define the facility that you want to upload your photo(s) to. 2.Browse to the photo itself, and give it a title, author, and date as necessary. 3.On the Location drop-down, select the SYS_LOC_CODE, which is where you should associate the location to. 5.When the upload is complete and you are ready to run the report, click on the Reports button (in EQuIS Professional) or EZView> Build Reports (in Enterprise). 6.Select the Google Earth: Locations Report. 7.Choose the appropriate parameters. 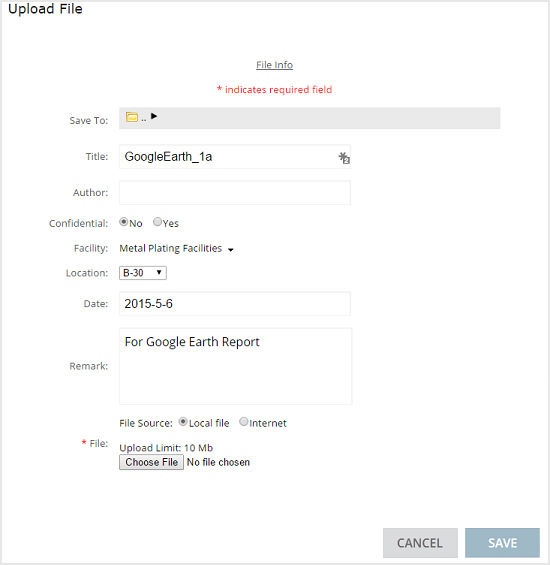 Select 'Embed Files' or 'Link Files' in the Description parameter to view associated documents in Google Earth. Note: Use 'Embed Files' for both images and documents in Google Earth Version 5.0+ as the 'Link File' parameter will not work in version 5.0 or newer. •After running the report, navigate to your 'My EQuIS Work' file. This file is typically found in My Documents. •*If you have not already installed 7-Zip, click here to download the software. 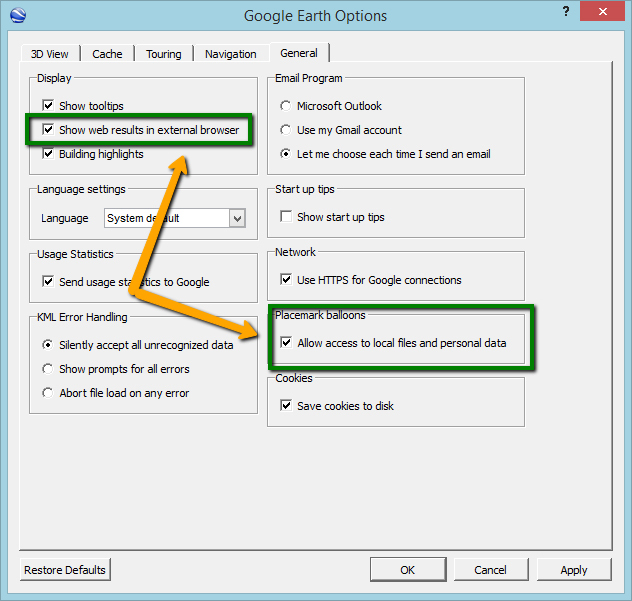 •Once your files have been extracted, open the Google Earth_Locations file created. When Google Earth opens and your locations are displayed, hover the mouse over each location to display the photo or document associated with it. 1.Use the Explorer Widget to upload the icon as an image (.gif, .jpg or .png). 2.Open the DT_FILE table and find the image file(s). 3.Set the PLACE_TYPE field equal to LOCATION_TYPE_CODE. 4.Set the PLACE_CODE field equal to the corresponding location type code for that image (such as Monitoring Well, Soil Boring, etc). The Google Earth output, which shows a table when clicking on a location, has been improved for readability by adding color to alternate rows. •Other applications besides Google Earth (such as ArcGIS Explorer) can read *.kml files - although EQuIS reports have not been tested extensively with anything other than Google Earth. 1.DT_COORDINATE.COORD_TYPE_CODE must be like "*LAT*LONG*"
5.DT_LOCATION.LOC_DESC must be populated before locations are clickable. DT_LOCATION.LOC_DESC is displayed in the 'callout box' when a location is clicked, if this option is selected. Example Output: View the following example or download the attachment: Google Earth_ Locations.kmz.